Making predictions is a tricky business. 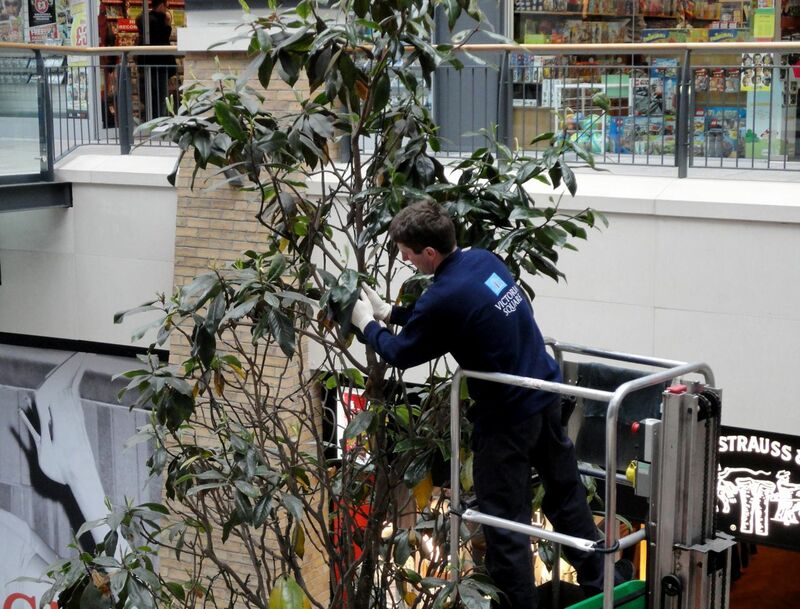 Futurologists continuously run the risk of embarrassing themselves professionally with their visions of the future. Mere mortals take an even bigger gamble. 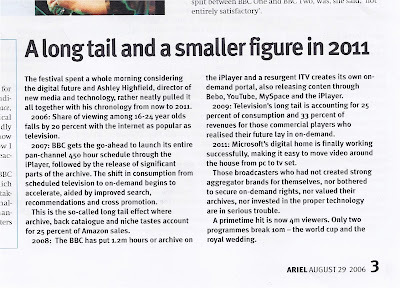 Leafing through a pile of old magazines that were finally on their way to the recycling bin, I spotted an brief article in the 29 August 2006 edition of Ariel. It listed Ashley Highfield’s chronology of the digital future between 2006 and 2011. Back in those days, Ashley Highfield was the BBC’s director of new media and technology. 2006: Share of viewing among 16-24 year olds falls by 20 percent with the internet as popular as television. 2007: BBC gets the go-ahead to launch its entire pan-channel 450 hour schedule through the iPlayer, followed by the release of significant parts of the archive. The shift in consumption from scheduled television to on-demand begins to accelerate, aided by improved search, recommendations and cross promotion. This is the so-called long tail effect where archive, back catalogue and niche tastes account for 25 percent of Amazon sales. 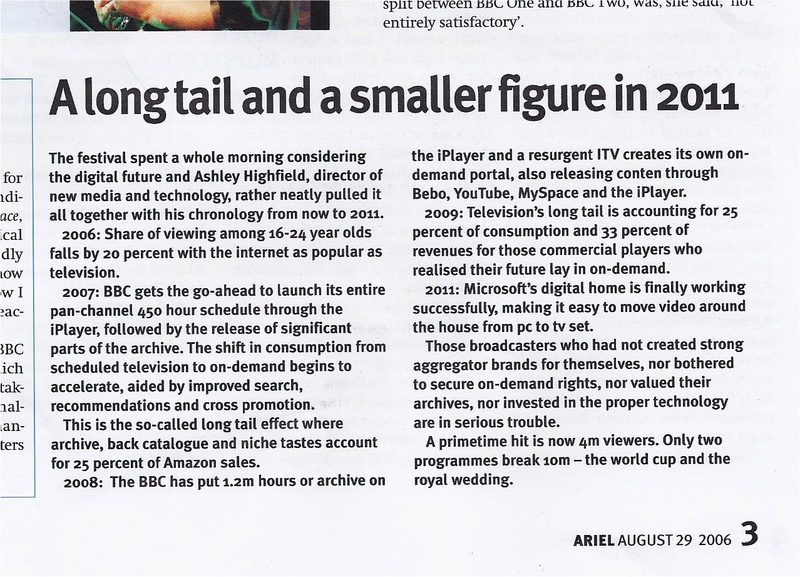 2008: The BBC has put 1.2m hours or archive on the iPlayer and a resurgent lTV creates its own on-demand portal, also releasing content through Bebo, YouTube, MySpace and the iPlayer. 2009: Television's long tail is accounting for 25 percent of consumption and 33 percent of revenues for those commercial players who realised their future lay in on-demand. 2011: Microsoft's digital home is finally working successfully, making it easy to move video around the house from pc to tv set. Those broadcasters who had not created strong aggregator brands for themselves, nor bothered to secure on-demand rights, nor valued their archives, nor invested in the proper technology are in serious trouble. A primetime hit is now 4m viewers. Only two programmes break 10m - the world cup and the royal wedding. Today Ashley Highfield works for Microsoft … and according to Wikipedia’s pen picture, his responsibilities probably do include getting Microsoft’s digital home finally working successfully! He was spot on with his prediction that there would be a Royal Wedding in 2011, though the wedding coverage achieved higher (than he predicted) viewing figures: BBC (13.44m, 62.8% share); ITV1 (5.79m, 21.0% share). The week of the wedding (35 April-1 May), Britain’s Got Talent pulled in 10.8m viewers, while Coronation Street, Eastenders and Emmerdale all topped 6m viewers each night. Episodes of hit dramas still achieve viewing figures of between 4.5 and 6 million. Linear TV isn’t fading fast - but whether Microsoft's digital home yet working is even more questionable! Niall Ó Donnghaile was only elected to Belfast City Council three weeks ago, but tonight was confirmed as Sinn Féin’s choice for Lord Mayor. He turns 26 at the weekend. Under the d’Hondt rotation, Sinn Féin will get three Lord Mayors during the next four years. Niall is a press officer with Sinn Féin up at the Assembly, and councillor for Pottinger. During his year in office, he’ll be able to welcome Sinn Féin’s Ard Fheis to Belfast’s Waterfront when it visits in September. Update - In case you're wondering, here's how Niall pronounces his name - it's not as difficult as people make out. Back in November 2009, I interviewed Niall and we talked about changes East Belfast, how Sinn Féin was developing, as well as what attracted him into the world of politics. I asked him whether he was hopeful that there would ever be enough of a vote to get a Sinn Féin candidate elected in East Belfast? 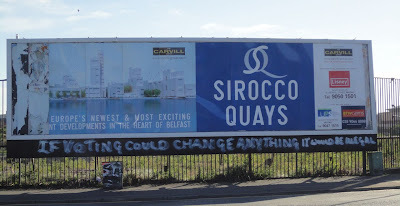 I don’t think it’s impossible, especially with what we alluded to earlier on and the changing nature of East Belfast. 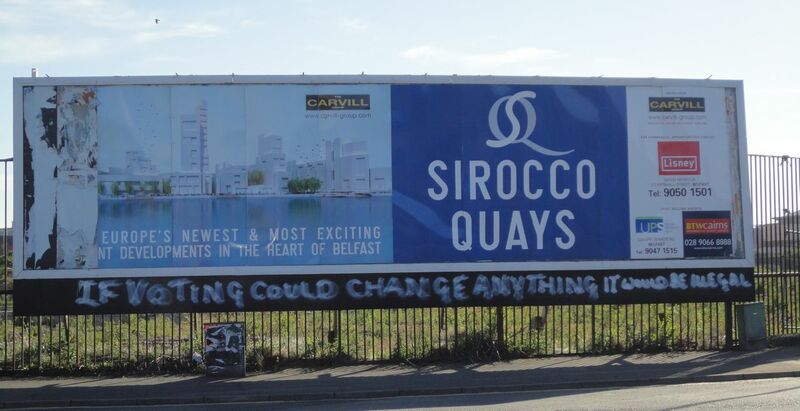 Once Titanic Quarter is finished, once Sirocco Quays is finished, this constituency is going to be dramatically different in terms of its makeup. You can read the full interview in a previous post. Cross posted from Slugger O'Toole. 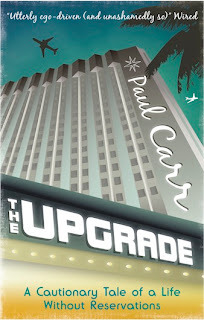 As I started to read Paul Carr’s The Upgrade: A Cautionary Tale of a Life Without Reservations I was quickly struck that he may well be using the latest instalment of the advance from his second book for a similar purpose. With hoteliers for parents, Carr was already familiar with the inside of hotels before I had his bright idea. Rather than renew his flat’s lease for another year, he’d instead become a “high-class nomad” and travel the world, living out of hotels for a year. Knowing that long-staying guests can get decent discounts, together with the brass necked ability to blag his way in and out of any situation, Carr aimed to spend an average of less than $100 per night on accommodation. At one level The Upgrade is a bible of tips for thrifty travellers. In most [US] cities you don’t pay local tax on stays over thirty nights. In the UK, [hotel] stays over twenty eight nights are VAT-free. Phone hotels direct rather than booking through hotel booking websites that are taking a commission (up to 15%) from the hotels. Reservation staff at independent hotels are more likely to be able to reduce rates than staff at big chain hotels. Emphasise [on the phone] that you don’t mind a bad room … Take whatever room you’re offered and then, on check-in, if you’re not happy with the room just stroll down to reception and complain. For frequent travellers, about two-thirds of the way through the book there’s a very familiar section in which Carr describes his minimal packing and unpacking routines, together with a handy tip about hanging your creased shirts up near to the steaming hot shower in the hotel room bathroom. Been there, done quite a lot of that. But at another level, the book is a cautionary tale about the factors that may lead you to waking up naked in the corridor outside your hotel room, spending a lot more money on alcohol than accommodation, stretching relationships – business and romantic – to breaking point (repeatedly), spending time in police stations, and managing to keep submitting columns for the Technology section of the Guardian despite spending more time in the bar than inside the conferences you’re meant to be covering. I remember reading some of Carr’s columns – many of them thoughtful and incisive – but never twigged the full context of how or why they were being written. There’s a hedonism that taken to extremes is no longer comfortably voyeuristic, but becomes deeply distasteful. I’ll not give away the ending. Suffice to say that by the end of the book, Carr had saved £800 by staying in hotels over paying rent, but more importantly, he had finally come to terms with his lifestyle. Let’s hope Carr’s third book is as funny and informative but less reeking of alcohol. Lanyon Place is normally a windy spot with the breeze from the Lagan swirling around between the tall buildings. But at lunchtime today, it was nearly impossible to walk past the Hilton Hotel and around the corner to the Waterfront hall. After a few seconds I gave up trying to hold myself and the camera steady. Just too windy. Hoardings around the abandoned building site loosened under pressure from the wind. News reports stated that "two people were slightly injured after hoardings came off a building at Lanyon Place in Belfast and hit their car". Certainly as we passed, one man was lying in the middle of the road, being held down/tended as they waited for an ambulance to arrive. Another man was holding another flapping piece of the fence in place. By the end of lunch, two policemen were quickly losing their rag with pedestrians as they hollered at them to only walk on the Hilton side and avoid the unsafe hoardings. The Railway Preservation Society of Ireland are running a series of Steam and Jazz nights on Friday evenings in June and early July. 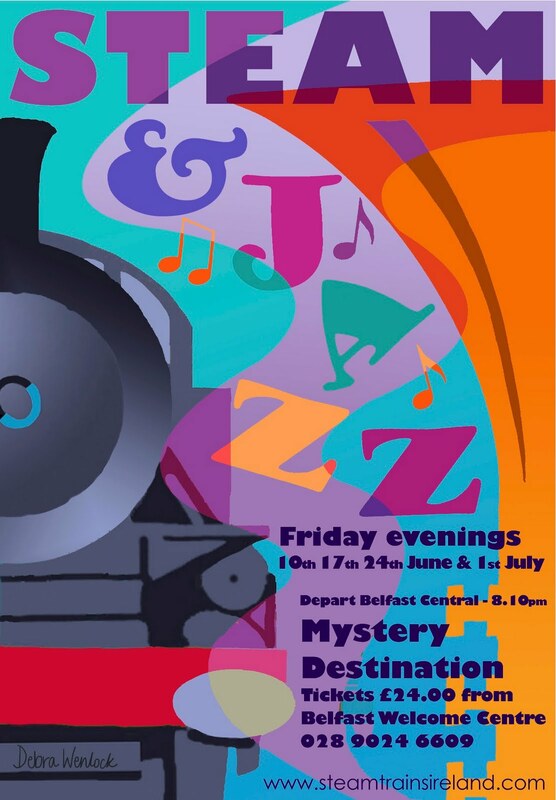 Their restored steam train will leave Belfast Central Station at 20:10 and will puff up the track to mystery destinations where you’ll be able to dance to the New Orleans jazz of the Apex Jazz Band before returning to Belfast around 23:45. Friday 10, 17 and 24 June; 1 July. All tickets £24. Get on your straw boater or posh frock and join our steam train for a Jazz mystery tour. Our train will include our Dining Car, complete with full bar, hot and cold drinks and snacks. A competitive wine list and bottles of wine will be available for purchase (as with all our trains, all profits simply go straight back into restoring more steam locos and carriages). Tickets for this starlight express must be booked in advance online, by phone (028 9024 6609) or in person from the Belfast Welcome Centre (47 Donegall Place, Belfast, BT1 5AD). Previewing summer arts and culture in Belfast - but what counts as culture in NI? What is culture? If you were asked to list "your top ten cultural highlights" coming up in Belfast this summer, what would you include? I recently agreed to compile such a list for the Guardian’s Travel website - published today - trying to shoehorn in a variety of events and festivals that reflect that will be happening across the city over the summer months. I was a little surprised when two of the entries on my original list were removed: Summer Madness and Orangefest. I've got to say first that I respect any editor’s right to decide what gets published on their website - that's certainly Mick Fealty's prerogative over on Slugger O'Toole! But in the context of Northern Ireland it seemed strange to eliminate two of the three largest events that attract visitors from outside Northern Ireland. After all, religion and politics are often at the centre of culture on this island … the very essence of the place! In the end I came up with a selection of fifteen, still leaving out many events that caught my eye. Ten made it into the finely illustrated Guardian's online article; and you can find the full fifteen below. I'm interested in your comments about what constitutes arts and culture in Northern Ireland, and whether I carelessly overlooked any Belfast events that you would have included on your top ten list. In a city which boasts more than 50 festivals each year, there’s rarely a dull moment in Belfast. Despite the cuts in arts funding, from early summer to late in August, Belfast is awash with books, drama, films, fragrant roses, live music and parades. And if all that culture doesn’t fill your days and satisfy your curiosity about what makes Belfast tick, check out the regular “duck tour” that uses an amphibious vehicle to explore the city’s streets before launching itself into the River Lagan. If you’re feeling energetic, stroll along for a two hour guided walking tour of the Titanic Quarter to find out about the city’s shipyards, maritime history and recent renewal. Or take a black taxi tour and the driver will be sure to show you around and where to find the best craic. Less than 5 years old, it had scorched the mattress before finally shorting/fusing. 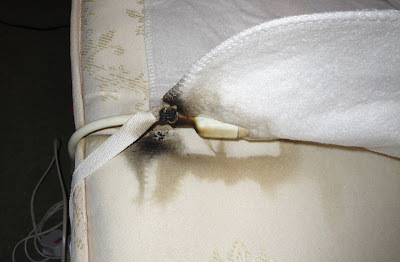 Update - some advice on electric blanket safety from the UK Fire Service Resource Group. Last month I posted links to some of the YouTube versions of the TEDxBelfast talks from the first ever independently organised TED event to be held in Belfast. You can read my review of the night's talks and sessions in another post, but this this post closes the loop and deals with the remaining talks. Maureen Piggot, director of Mencap in Northern Ireland, was a revelation amongst the evening's speakers. She provided a window into a world of which I’m mostly ignorant. Sinclair Stockman was the first presenter of the evening, taking the subject of A Fully Interactive World. He took a look at a number of very ancient technological advances in early postal and communication systems. Sinclair was taken with the vastly distributed (though low volume!) postal system set up in the time of Genghis Khan. He pointed to infrastructure sometimes getting in the way of efficiency. Sinclair said it was criminal that while Northern Ireland probably has the best broadband network of any territory its size in the world, yet we have 20,000 illiterate children. UUP election posters - reduce, reuse, re:cycle? 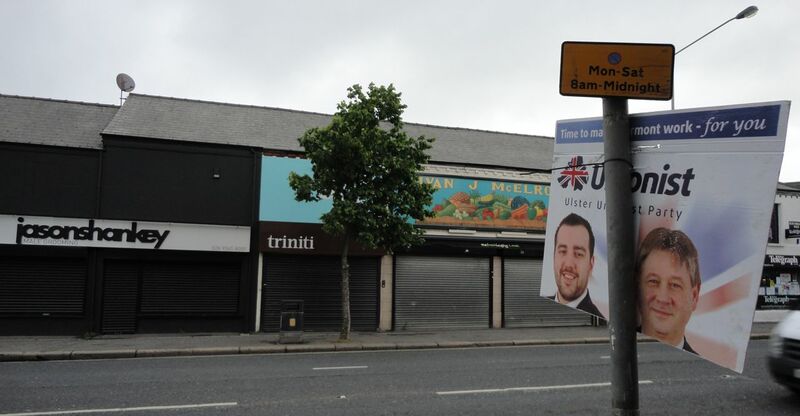 Walking up the Upper Newtownards Road after lunch, I was amazed to see a Lagan Valley UUP poster for Mark Hill and Basil McCrea at the roadside. 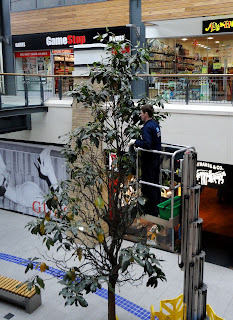 Turned out that it had been ripped in two and was being used to advertise the starting point of a bikers' event. Happily a case of reuse in aid of re:cycling rather than the Ulster Unionist Party completely losing its sense of direction! In conversation with David McMillan - What authority does the Bible have in 21st century pluralist society? After last month's fascinating In conversation with PSNI Chief Constable Matt Baggott who was talking about the role of faith in how life and work, Contemporary Christianity return to their normal city centre venue on Tuesday night. After sharing his opinion, there will a time of questions. Tea/coffee and biscuits are promised! It’s an open and free event – everyone is welcome – no booking required. Tuesday 17 May 2011, starting at 7.30pm. 3rd floor, 21 Ormeau Avenue, Belfast, BT2 8HD. 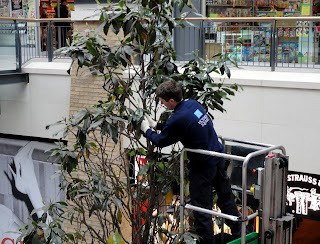 Dusting gloves come in handy when the trees get a bit tatty! 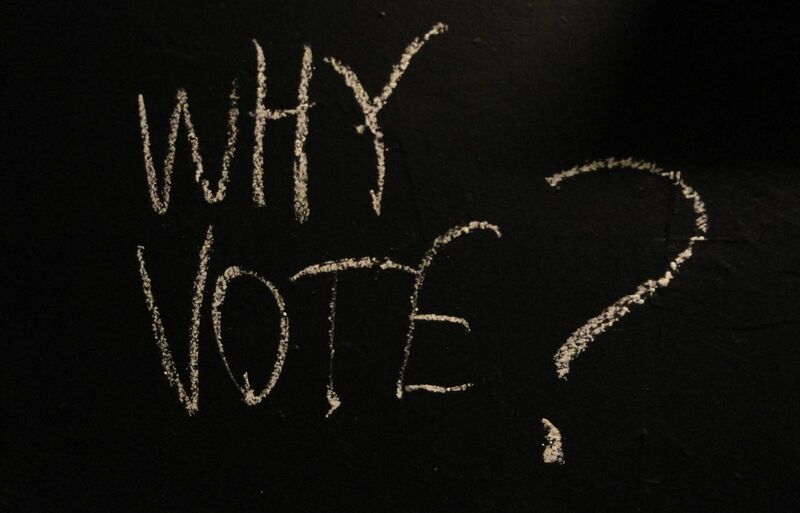 Where were you when ... the NI referendum count finally finished? Elections can bring about powerful political moments that become firmly lodged in society's civil memories. Perhaps the most classic example happened 14 years ago in the 1997 General Election: "Where were you when Portillo lost his seat?" Last Friday night - well, technically last Saturday morning - I realised that for most people the answer to "Where were you when the NI referendum count finally finished?" was going to be, quite sensibly, "tucked up in bed fast asleep". But for eight people, their alternative answer was "at the Kings Hall!" It was a quite a contrast to the previous referendum in Northern Ireland – the Good Friday Agreement poll – which was announced in the same Kings Hall venue to vast crowds of waiting politicians, campaigners and the world’s media. After the final constituency count completed in Fermanagh & South Tyrone, the regional AV referendum result for Northern Ireland was finally declared at 2.10am in an almost empty Kings Hall … shortly after the overall UK result was finally able to be announced in London. No official media were present when the announcement was made by Graham Shields, EONI’s Chief Electoral Officer, who stood at the special referendum podium that had otherwise remained unused all day and addressed the gathered group. Two Electoral Commission staff, one former Chief Electoral Officer, three Yes Campaign reps, and a blogger/electoral observer. Collating the results together for the referendum ballot boxes that had been verified and counted in the eight count centres across Northern Ireland, the local results were less negative than much of the rest of the UK. 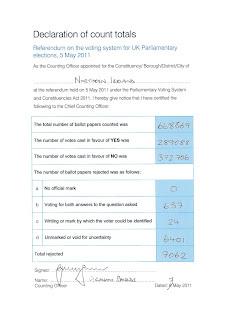 But it was a little piece of history – the final piece in the AV referendum jigsaw – so I slightly blurred my electoral observer role and recorded the moment for posterity! The sharp eyed amongst you will realise that the numbers don’t quite tally, and there were in fact 13 missing votes – which is not unusual with a poll of this size. And the pre-printed date had to be changed from 6 May to the 7th! In case Tuesday’s late night leaders’ debate whet your appetite for midnight political listening, here’s one last election treat. It’s a recording of last night’s East Belfast election hustings, held in Knock Presbyterian Church. I wasn’t there, and I haven’t had time to listen to the whole thing, but a couple of friends who were there said they enjoyed the evening. Thanks to KPC for the recording. Apparently there’s no mention of the recent dissident activity, no mention of the City Airport. Instead there’s health, education, sickness absence, women candidates, AV, ending with some “cruel questions” from host Mark Simpson which revealed an Alliance prediction to win 11 seats and a reiteration of the DUP commitment to take the Finance ministry first, and pick up Education as their second choice if it is still available. Over the past month or so, I've been posting on Slugger O'Toole a series of "Catching up with ..." interviews with representatives from smaller political parties who are standing in this week's Assembly and/or local government elections. The links below will take you to the individual posts which contain transcripts for those who like to read, and clips of video for anyone who prefers to watch and listen. While the candidates featured are standing in particular council areas or Assembly constituencies, bear in mind for many, their parties have candidates standing elsewhere too. The idea was to explore different political perspectives which tend to be less frequently voiced in the local media, pointing out that the big parties aren't the only ones with something to say. With voter apathy reportedly on the increase again, maybe bored voters will find something of interest in the hotch potch of groups. It's been a fascinating process - and many thanks to all the candidates who participated. I'd like to say that if there had been more time, I'd have talked to more people. Certainly there are other fascinating candidates out there - in particular some of the independents - but frankly energy didn't permit! Incidentally, the most viewed video from the series is one of the clips with éirígí ... though even that is eclipsed by Granny Turismo scooting around the Cathedral Quarter on their oversized shopping trolleys! For anyone in East Belfast, by virtue of posting a photo of one of Roy Hobson's posters and asking why it was so hard to find out anything about this independent candidate for Victoria Ward, Roy replied and gave an overview of his policies in the comments underneath the post. IT also turns out that there are issues with the imprint (election agent and publisher details) on his posters that he had to overcome with sticky labels on the reverse. 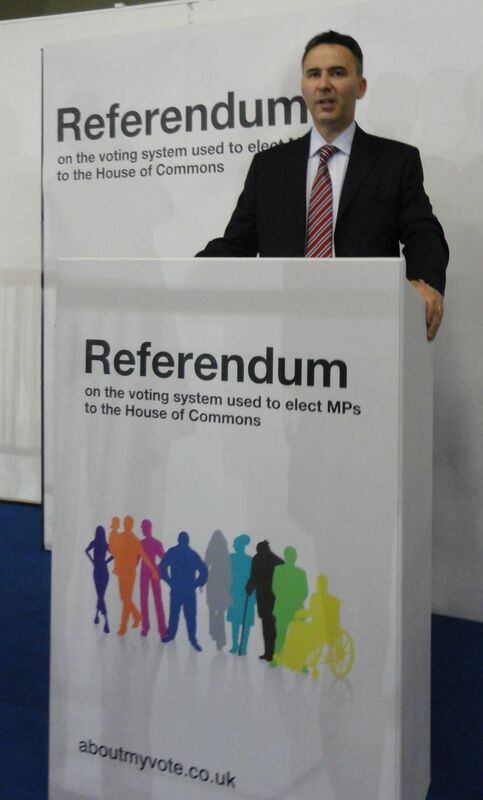 Lastly, as well as the Assembly and local government elections on Thursday, there's also the matter of the referendum on voting reform. I caught up with Eddie Izzard who was in Belfast (briefly) on Sunday evening to support the Yes2AV campaign. If zooming around on oversize Segway scooters dressed up as shopping trolleys is your thing, then look out for Granny Turismo motoring around the streets of Belfast as part of the Festival of Fools.